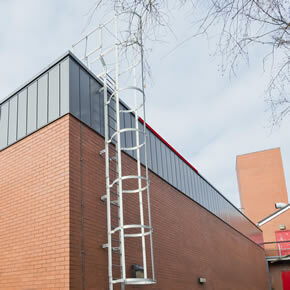 Alumasc has provided bespoke Skyline fascia soffits for installation on the roof of a Manchester fire station. Whilst being fully operational, the Greater Manchester fire station provides training facilities for new and existing firefighters, including teenage cadets. As part of their training, firefighters are required to abseil down the side of the building. However, as a result of this, the brickwork on the parapet wall had started to falter; station management required protective cladding to prevent further damage. Alumasc was contracted to provide a solution. The company specified approximately 30 metres of its Skyline coping and vertical fascia systems to reinforce the areas used for training. These zones were finished with a bespoke red powder coating, to differentiate them from the rest of the building. The installation was carried out by Roweaver Developments, an Alumasc-approved contractor. The team collaborated with Alumasc’s technical team to fit Skyline; specialist scaffolding was used to install the system in difficult areas. Manufactured from polyester powder coated aluminium, the Skyline system is available in four standard shapes with a range of roof edge details. Bespoke designs can be ordered to suit specific applications. Skyline’s fabricated fittings are mitred and welded with a smooth finish; its linear components are joined together by internal brackets.